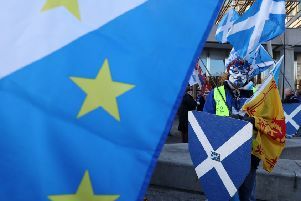 A DOSSIER naming and shaming almost 50 cybernats, who appear to be SNP members, has been compiled by Labour as it renews calls for Nicola Sturgeon to tackle online abuse. The document lists numerous tweets denouncing supporters of the Union as “quislings” and “traitors”. Some of the tweets are abusive towards women and English people and much of the language exposed by the document is too foul for repetition. The contents of the dossier were made public by Labour at the end of a week that saw Sturgeon warn that SNP members who “cross the line” will face disciplinary action. Sturgeon made the pledge after the issue was yet again highlighted last week. Labour’s dossier identified 46 Twitter-users, some apparently using their real names and others using pseudonyms, peddling abuse online. Their tweets included evidence that they had joined the SNP. Scott used an offensive term to describe Tory leader Ruth Davidson’s sexuality, described pro-Union politicians as traitors and suggested that the Liberal Democrat Willie Rennie, the former prime minister Gordon Brown and the late Charles Kennedy ought to be hanged. Labour’s business manager James Kelly said: “Scottish politics has some of the most passionate debate anywhere in the world, but far too often that debate can turn into the most horrific of personal abuse. “Parties cannot be held responsible for every abusive message that comes from people who might share their views. But every person in this dossier is, by their own admission, an SNP member and the party does have a responsibility to deal with this culture within their own ranks. “The First Minister has acknowledged that the SNP has a problem here and has pledged to tackle it. “We see ­cybernats regularly hurling vicious abuse at politicians, particularly women. “It cannot be within the SNP’s code of conduct to allow vile misogynistic abuse towards people who do not share your opinions. Cybernat abuse featured heavily during the general election campaign when it emerged that an SNP candidate Neil Hay described No voters as quislings and mocked elderly No-voting Scots for “barely knowing their own name”. Hay was the only SNP candidate to lose out to Labour in the election. The SNP has repeatedly pointed out that online abuse is not confined to independence supporters. Sturgeon has been subjected to death threats over the internet.